Soccer fans lucky enough to be traveling to Brazil for the upcoming World Cup are hearing an earful of consumer warnings about potentially onerous smartphone roaming charges and credit card ripoffs at ATMs and restaurants. It's not that soccer matches are any more dangerous for smartphone and credit card users than any other mass sporting event, including the Olympics. But bigger crowds do attract thieves -- both in the physical and virtual worlds. "Fraud events follow specific sporting events, and ATM and point-of-sale skimming of credit card accounts are rife for fraud, especially at high-density events in smaller and mid-sized cities," said Seth Ruden, senior fraud consultant for ACI, a global electronic payments company, in an interview. "There's a significant chance of an organized fraud effort by organized crime at the World Cup." 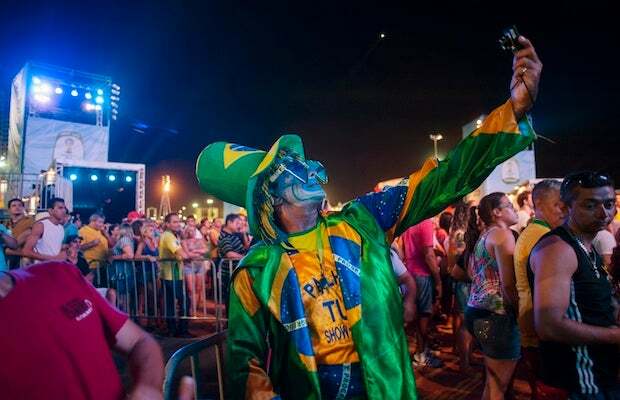 About 3.56 million soccer fans and tourists are expected to spend $3 billion during the monthlong event that happens in 12 locations throughout Brazil, ACI said. The competition starts Thursday and runs through July 13. Brazil generally has a history of ATM and counterfeit payment card fraud. Cleber Martins, director of risk solutions for ACI in San Paolo, said criminals in recent years have been able to use wireless networks to quickly compromise a credit card and then use the account "just hours later." Fraudsters can install a modified cell phone along with circuits and others elements of small devices like iPods behind an ATM, Martins said. With that gear, they have the ability to skim an account number from a magnetic credit card as it is swiped through a card reader, and can quickly pass the data over a wireless GSM network. Thieves can also hack the ATM's video of an individual's PIN number as it is typed or gather the information from a nearby camera. Most credit card users are well aware that they aren't generally liable for fraud on their accounts and won't have to pay for fraudulent purchases. The problem with that thinking is when a card is defrauded, the issuing bank will typically block the account immediately, leaving the legitimate user without a credit card to pay for meals or lodging in a foreign city, Ruden said. Smartphones equipped with payment technology such as near field communications could help tourists avoid fraud problems associated with magnetic stripe credit cards, but NFC smartphones aren't in wide usage in Brazil, Ruden said. As in any busy venue around the world, ACI recommended that ATM users watch out for fake ATM's that thieves set up to grab card information. Customers should watch a potential ATM to see if other customers have gotten any cash and avoid using it if they haven't. Ruden suggested one way to know if an ATM is fake is to type in an incorrect PIN: if the machine lets you proceed, it probably isn't legitimate. To avoid point-of-sale fraud, ACI issued age-old advice: Don't let anyone walk away with your card, including a waiter or store clerk who could copy the account number and expiration date. "Paying with cash reduces the likelihood of getting defrauded," Ruden said. A different kind of consumer warning was recently issued to World Cup travelers, especially those from England, who will use their smartphones in Brazil. The U.K. Web site uSwitch.com found smartphone visitors to Brazil face the risk of spending as much as £486 (US $815) per day on data roaming, phone calls, text messages and video streaming. Roaming charges are capped within Europe, but not in Brazil. The website found that a one-minute phone call from Brazil to England could cost the equivalent of $3.35 a minute, and could cost as much as of $13.40 for 1 MB of data. (An HD movie lasting two hours is around 3 GB). All the major U.S. carriers urge their customers to consult the carrier websites to set up smartphone travel plans for the countries they are visiting to avoid exorbitant costs and bill shock. XCom Global took advantage of the uSwitch warning about roaming and calling costs from Brazil to advertise its unlimited data access and worldwide coverage, including Brazil, at rates it says are well below standard international data roaming charges, without long-term contracts. XCom Global also rents cell phones for international use at $15 per day, and will offer a discount of one free day of use with the discount code "FIFAFREE" used when ordering on the company's website. Most international travelers know to use free or low-cost Wi-Fi networks to avoid big data roaming charges. Aptilo Networks, based in Stockholm, announced it has set up Wi-Fi offloading for three of Brazil's largest operators -- TIM, Oi and LInktel. Linktel operates an independent network of 2,300 Wi-Fi hotspots in Brazil, but it isn't clear how accessible these hotspots will be for international tourists to the World Cup. This article, Warnings for smartphone, credit-car users at World Cup, was originally published at Computerworld.com.